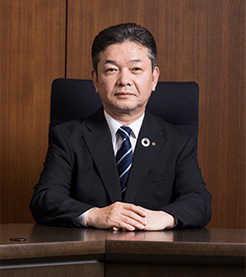 Letter from the President | Toyoda Gosei Co., Ltd. The Toyoda GoseiGroup has grown to have 65 companies in 17 countries. Under the company creed of "Boundless Creativity and Social Contribution," we grow our business and contribute to society through the provision of mainly automotive products that use rubber and plastics technology. Today, the automotive industry is in midst of a huge transformation, including advances in autonomous driving and electrification. In order to take this huge wave as an opportunity and achieve sustainable growth in the future by responding flexibility and swiftly to changes in the business environment, in April 2018 we announced our medium-and -long term business plan, called the Business Plan 2025. With the three pillars of "Venture into innovation, new mobility," "Strategy for growing markets/fields," and "Innovative manufacturing at production sites," and the power of all 38,000 employees working together, we aim to grow as a global company that delivers the highest levels of satisfaction to customers worldwide through safety, comfort, well-being and the development.